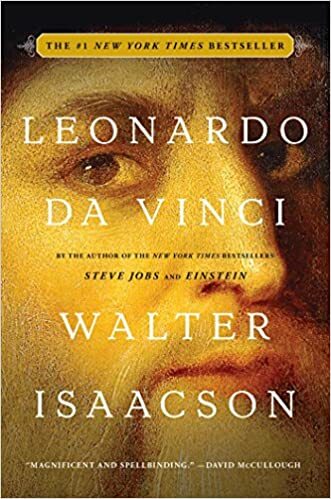 Leonardo da Vinci has fascinated me for a very long time, so when I learned of Walter Isaacson’s biography of the quintessential Renaissance Man, I snapped it up. The hardcover edition is a hefty tome, not merely by virtue of its 624 pages, but also because of the heavy coated paper, employed to better display the many color plates and illustrations that are scattered throughout the book. I’ve always taken pride in being a generalist. Robert Heinlein, in one of the few quotes of his that I like, said “Specialization is for insects,” and for myself, this feels like truth. For me, it fits. While I am thoroughly capable of obsessing about…well, about pretty much anything…I am not capable of concentrating on one topic, to the exclusion of all others, for the years it would take to become an expert. My freewheeling curiosity is impossible to constrain lest it becomes bored, not through having learned all there is on a topic (far from it), but because my mind tends to wander as I wonder, leading me astray from the path on which I began. As a result, my history is littered with cobwebbed interests and skills, all of which were at one time a grand passion but which now have been shunted to the side by the necessities of surviving in our rapid-fire and increasingly frenetic world. So, while I can play a concerto, compose a sonnet, cure a pork belly, repair a pocket watch, restore a fountain pen, landscape a garden, tune a car (or a piano, for that matter), cook a goose, shoot an arrow, renovate a kitchen, arrange flowers, write a novel, and make beer, I am at best (by my standards) a journeyman in these subjects, and far from expert. Unfortunately, generalization is not a valuable commodity in today’s world. Where once being a “Renaissance man” was a thing to be admired, now it is an anomaly, a throwback to an earlier time, anachronistic and useless outside of dinner parties and a guest spot on QI. Normally, none of this bothers me, but this past year has been a tough go, fraught with missteps and failures, chock-a-block with mediocre results born of my mediocre talents. In many cases, were I to do as my grammar school teachers instructed and simply “apply myself,” I might be able to acquire the expertise needed to achieve my desired goals, be they in the kitchen, in the garden, or in the writing studio. This isn’t a pity party, though. Nope. Check your sympathy at the door. I don’t need it. Thanks, but no thanks. I don’t need sympathy because, when I begin to doubt myself like this, it’s because I’m judging myself by yardsticks of others instead of by my own, and that’s a sure sign I need to step back and reevaluate. I’m a generalist, and I prefer it that way. I just need to come to terms with the ramifications, and remind myself of the advantages that decision brings.